Something going wrong during a speech is every business speaker's nightmare. For those who find public speaking difficult it confirms all their worst fears. But if things do go wrong it's unlikely to reflect badly on the speaker as long as they handle it well. something goes wrong with the venue such as a fire. If you suddenly lose the plot, suddenly start to panic and can't carry on, then you may be able to get away with it. A second or two feels like a lifetime on the podium but it isn’t a very long time for the audience. If you lose your place in your notes and feel panic rising, simply take a few slow breaths – they don't have to be too deep, just slow – to calm your body. Then take a fresh look at your notes and the chances are you will be able to pick up where you left off. If the pause is longer than a few seconds then this isn't going to work and it's time for some damage limitation. Of course if you are having a genuine panic attack then you should get off the stage and look for medical attention. If it is not as bad as that but you don't think you'll be able to continue for a while, honesty is the best policy. Simply explain that you're having difficulties and walk off. Let the MC or other person in charge of the event take over. If you can't even get the words out to excuse yourself, ask the MC to do so once you're off the stage. If the MC can ask the audience to be patient for five minutes while they try to rectify the problem, that'll give you the time to collect yourself and see if you can go on. With a business speech the audience is likely to be on your side so you should expect to be received back to the stage warmly. If you can't go on simply ask the MC to explain what's happened to the audience and to ask them to reconvene at the start of the next presentation. If something goes wrong with IT or presentation equipment, and it does, then good preparation will come to your aid. If you rely too much on the presentation to provide your cues you will be in trouble if it stops working. So try to memorise the bullet points of your speech so that you're not lost if the presentation kit goes down. If you have notes, cue cards, or a printout of the presentation you should be able to carry on without it. As many business speakers offer their presentations for download after the event, you can perhaps mention this, apologise and move on. If the venue is big enough to need amplification and the sound goes, you are in a slightly trickier situation. 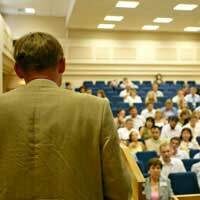 If possible, ask the audience to move to seats nearer the front so that they have a better chance of hearing you. While speaking look at a point on the back wall a couple of feet above the head of someone in the back row. This will automatically improve your projection and more people will be able to hear you. In both cases the venue will almost certainly have staff on hand to help out but you don't know how quickly the situation will be resolved so it's best to carry on. If the problems are put right then simply go back to where you were and continue with your speech. If something goes wrong at the venue, such as a fire alarm or other alert, then again preparation will be invaluable. At all business speeches, where members of the public have been invited, the emergency procedures, exits and muster points should be explained by the speaker who opens the proceedings. It is well worthwhile finding out all this information independently in case the person doing it forgets or does not give clear instructions. As you will be on the podium if and emergency happens, people will naturally look to you for guidance as a de facto leader. If you have the time, tell people from the podium that you think they should leave by the emergency exits. Tell them this as calmly as possible, then lead the way out. Don’t feel responsible for getting everyone else out safely, but make sure you are safe and know what the situation is before going back to help anyone who needs to be helped.